…and trying the extremely powerful sds project. Pete Robins has completed the stand up version of the Mianog prow project. Isles of Wonder 8B tackles the right hand edge of obvious steep prow line up at the left side of Carreg Mianog in the Ogwen Valley. The line was first spotted by Neil Dyer earlier this year when he was out for a run. It does sit in plain view and can actually be seen from the road, but for some reason no-one had noticed it before. Neil has been dogged by injury of late so was not able to capitalize upon his discovery – being the gent that he is he spread the word so that others could try the line. Pete Robins was the keenest suitor and after several sessions spread over a few months he managed to crack the stand up version. 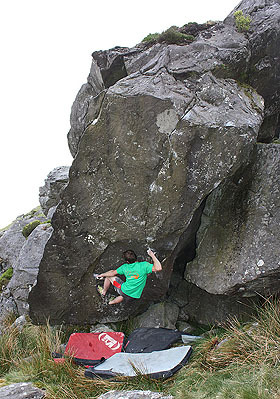 On the day his attempts were dogged by rain showers - he even had to hang a jacket over the lip to keep the holds dry. The sitting start remains an obvious, but obviously difficult (i.e. 8B+/C) challenge. During an early session Pete also climbed the left edge of the prow from a sds to give the superb Nut Stash 7B+. Ed’s note: apologies for the late reporting of this but I got the text from Pete just as I had landed on the first day of a family holiday down the Lleyn. 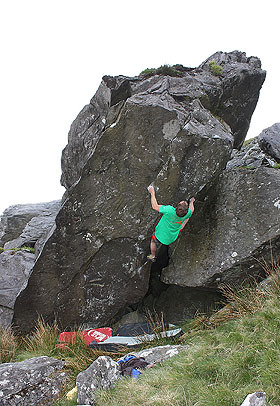 Typical – the biggest news in Welsh bouldering for ages and I’m not around to get the scoop! Check out Ray Wood's pics of Pete on the first ascent over at the DMM website. DMM website.